" Twist Forms. Dance Theory of Argentine Tango "
"Twist Forms. Dance Theory of Argentine Tango"
The book will be immediately mailed to you. "This book establishes fundamental concepts and terms for the formalization of Argentine Tango dance. 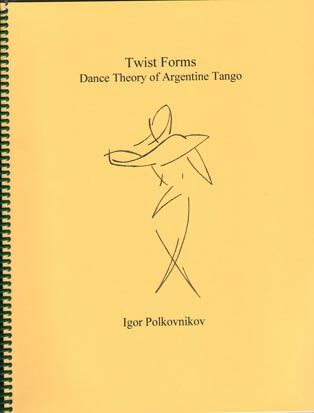 It has a dual goal: to establish a set of axioms and rules for artificial, computerized dance creation and to serve as a foundation for understanding and teaching the Argentine Tango itself. How well is this goal accomplished, future developments may show. The author has a background in Argentine tango, but believes that it is possible that the proposed concepts can serve as a basis for formalization of other dances and movement activities. Essentially, this book about human movements, their origins, dance technique in general, approaches to improvisation, and some other things. For dancers who are reading it, I must say that this is not an instruction booklet. The concepts introduced are abstract and difficult from the very beginning. The logic of building a workable theory requires that."